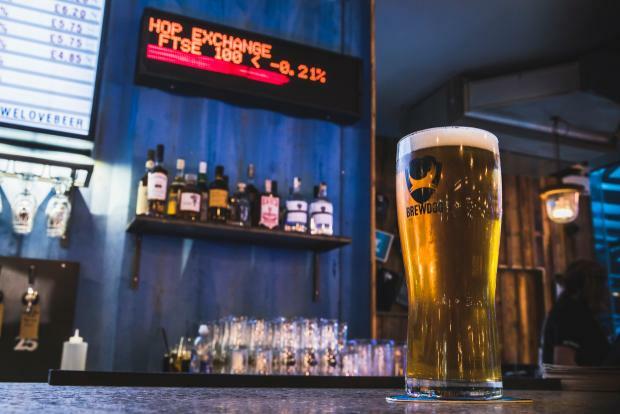 BrewDog company that has a net of 70 bars worldwide famous for its craft beer has opened its first bar in London that accept Bitcoin (Bitcoin) and Bitcoin Cash (Bitcoin.Cash) cryptocurrencies as means of payments today. This will be the second “cash-not-accepted” bar after the one the company has in Clerkenwell region. One of the most well-established brewery companies in the UK, Brewdog has chosen the financial district of Canary Wharf for a new location. Recognizing the surrounding neighborhood, the pub offers a special line in the menu: a draft beer with a price that depends on the movement of the Financial Times Stock Exchange 100 Index (FTSE 100). A specially build digital panel on top of the bar table will show market activity for the "Hop Exchange" beer. James Watt, a co-founder of BrewDog sees his new bar on the front row of the payment revolution. "We’ve always prided ourselves on our desire to keep innovating. We’ve done it with beer, we’ve done it with our business model, and now we are championing a new way of paying for a pint," — he says. The company plans to turn all the existing bars cashless and make sure the future ones will be also accepting cryptocurrency payment system.